Workshop for the Whole Body now available! Check out the Entire Body Program Here. Does stiffness, immobility, guarding, lack of recovery, & constant re-injury hamper your performance when you exercise, play your favorite sport or just going out on a walk? Are you aware of the new paradigm in health & fitness? 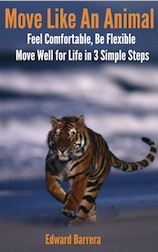 All healthy vertebrate animals use the “pandicular response” to move with flexibility, power, agility and ease. Just like Fido and Simba from the Lion King, you too can access the part of your brain that instantly resets the resting level of your muscles. Your cat and dog never stretch, they fully contract their bodies and then slowly release.They don’t hold a stretch for any length of time, instead they “pandiculate” and this is why they are supple, fast, quick, and move easily…. After all, you won’t see a dog or cat going to an aerobics class, they know how to access the part of their brain which resets the muscular length and off they go. How would you like to chuck the ibuprofens, ice/heat packs, balms, epsom salts, and never have the need for a hot tub? You can tap into the pharmacy that lies between your ears. Well, it’s so easy that your cat or dog can do it and I can teach you how to enhance your body’s response using your brain’s own output so you’ll move with such ease that you can’t believe it’s really so dog gone simple and you’ll never need your old ways again. Dare you to show ’em an old dog can learn new tricks. Change your Brain & Body to Instantly Free Yourself & Feel Good All Over Again.